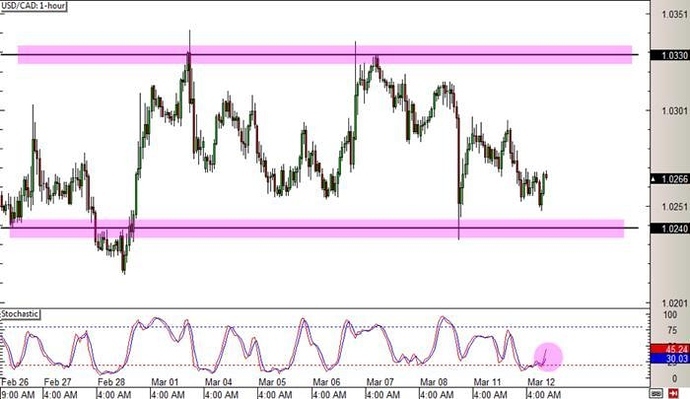 USD/CAD has stalled from its recent rallies as it started to move sideways since last week. 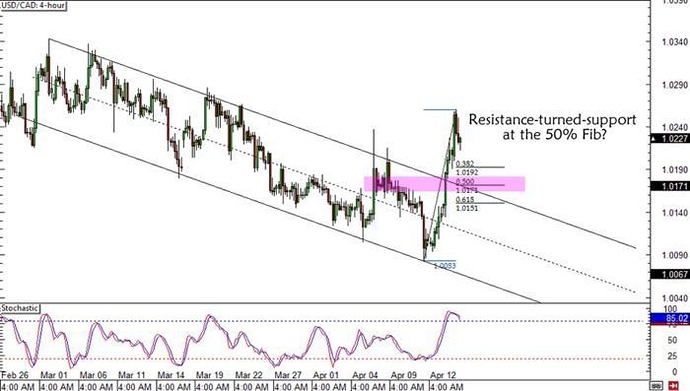 The pair is moving between support at the 1.0240 area and resistance around 1.0330. 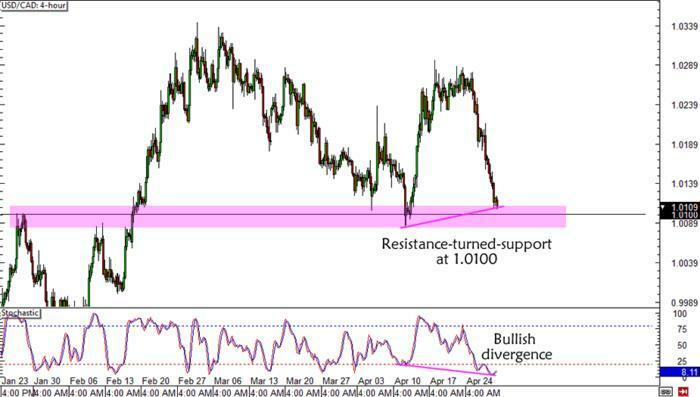 Stochastic is crawling out of the oversold region at the moment, suggesting a potential bounce back up to 1.0330. Or is another test of 1.0240 in the cards? 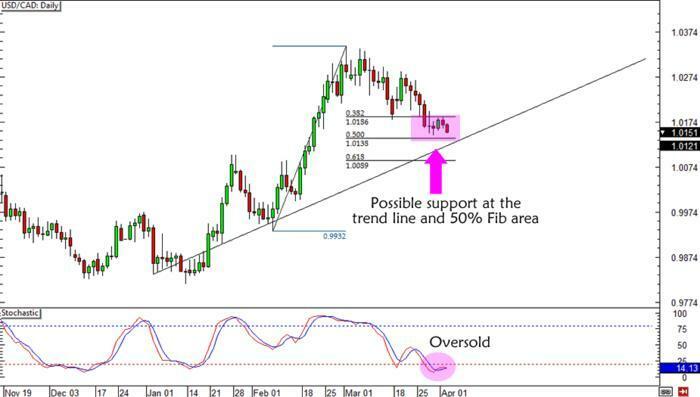 If you like trading trends then you’ll be happy to see that USD/CAD’s rising trend line is backed up by a possible 38.2% Fib support on the daily chart. Stochastic is almost oversold, too, so you might want to place your long orders if you think that the Loonie is still headed south. 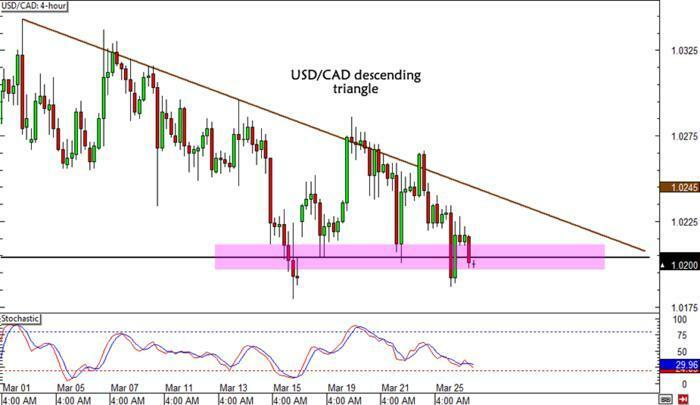 Check out this descending triangle pattern on USD/CAD’s 4-hour time frame! The pair is close to testing the bottom of the triangle, which is just around this week’s bottom WATR and the 1.0200 major psychological support. Will this level still hold? Yes a break to the down side. Some lower lows occurring recently. Oil is up so that should support the Loonie. Gravitation to mid point of last few months of about 1.005 to 1.1. Longer term (few months out) possibility of .98. I will take some/all profits at 1.1. I have been short the USDCAD from about 1.0275 since I posted sometime earlier in this thread. 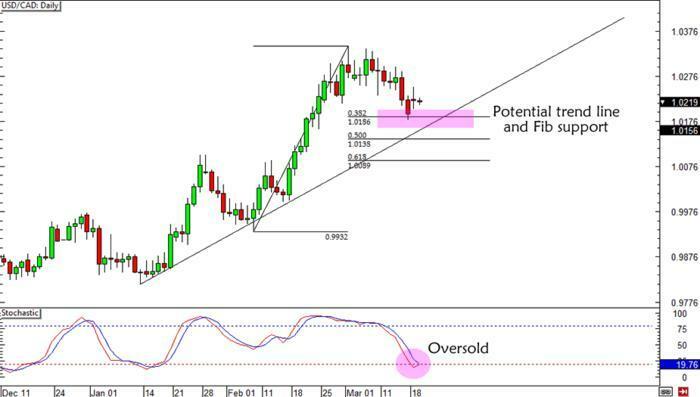 If you’re one of the Loonie bulls and you’re looking for a place to take profits, then maybe you can consider the 50% Fib on the daily chart, which is near the rising trend line that has been holding since the start of the year. Oh, and Stochastic is in the oversold area too! 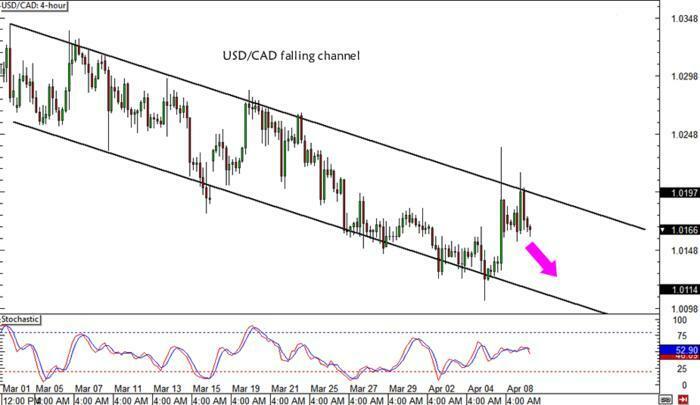 USD/CAD is crawling in a pretty tight channel on the 4-hour time frame, as the pair made lower highs and lower lows. After testing the top of the channel recently, it could head right back down. Stochastic is offering no clues since it’s currently on middle ground. Watch out for potential support around the 1.0100 major psychological level! Hey look, USD/CAD already broke its falling channel! If you think that the Loonie isn’t done falling just yet, then you can probably wait for the 50% Fib retracement, which is near the top of the broken channel and a former resistance area. Be careful of Stochastic though! Congrats! Are you planning to trade the Loonie again this week? 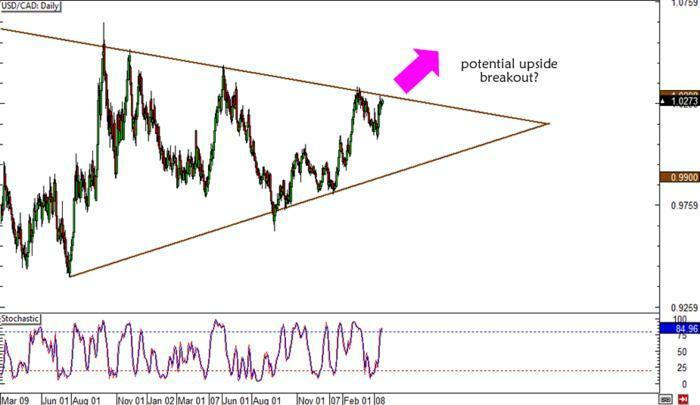 Watch this graph: the aluminium usually anticipates the UsdCad trend. Considering the bear market of this metal, for the coming weeks we can expect a weakness in the Loonie. Here we can see that the price is stuck inside a symmetric triangle since long time. Now the price is testing upper stream of the triangle and hence I wish to hold a bearish Bias. Here the price is finding resistance on a falling trend line in the weekly chart. 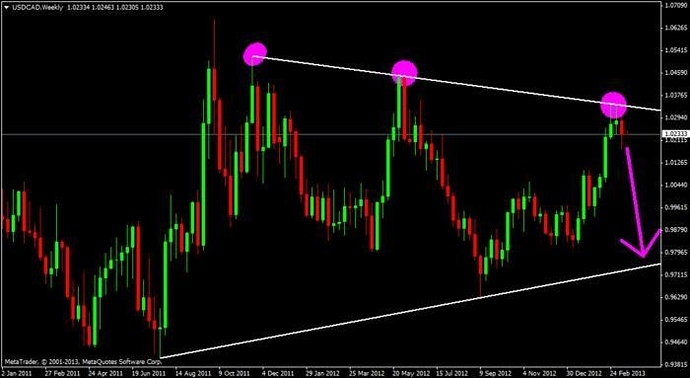 Here the price is clearly testing the falling trend line after a bounce from the rising trend line in the weekly chart. Price has already broken the short term trend line in the four hour chart and completed it’s pull back. Make sure that you have placed your stop loss. Here we can see that the price has already passed through the long term falling trend line and is moving towards the newly formed falling trend line. Hence Bias is Bullish. Here, it is clear that the price is climbing towards the new falling trend line in the monthly chart after finding support at the rising trend line drawn in this weekly chart. Here we can see that the price is already bounced from the weekly rising trend line and is moving up with support from a new rising trend line in the Daily chart. 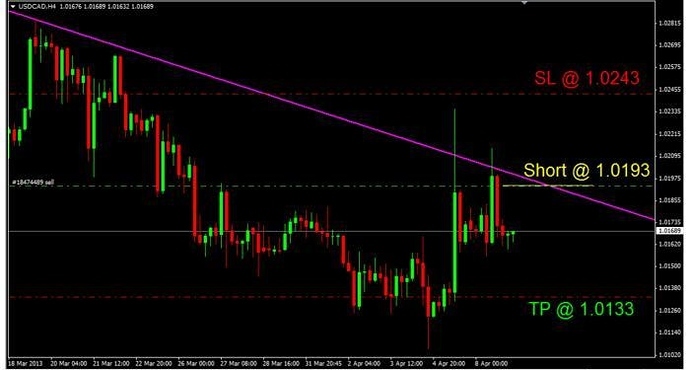 Here also price has started climbing upwards from the rising trend line. Please don’t forget to put your stop loss. We are not the market movers. Trying to profit from possibilities. USD/CAD has been consolidating inside a long-term symmetrical triangle on the daily time frame, but it appears that a breakout to the upside is in the cards. After all, stochastic is still climbing, which means that the pair could be headed further north. How high can it go? Too much pessimism around the Canadian Dollar. 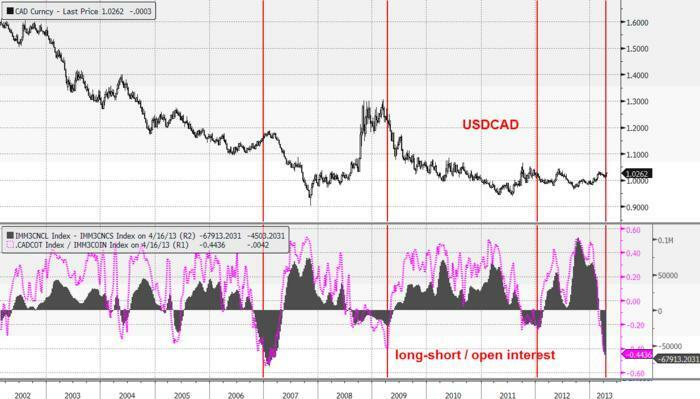 Short positions record for the hedge; in the past, this favoured the formation of a primary top on UsdCad. Too negative sentiment on the Cad, and so the week is closing with strong buys. The data of the Cot Report of Friday confirm once more a negative sentiment on the Loonie. Short on UsdCad, to be preferred until the parity. When it comes to USD/CAD I have learned to trust psychological levels. This time the pair is about to test 1.0100, which was a previous resistance level. Not only that, but there’s also a bullish divergence and an almost oversold Stochastic signal on the 4-hour chart! Think it’s gonna go up soon?